Action: Choose a non-event card with printed cost 3 or lower in your discard pile and return it to your hand. 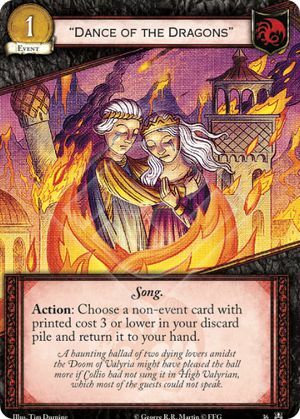 A haunting ballad of two dying lovers amidst the Doom of Valyria might have pleased the hall more if Collio had not sung it in High Valyrian, which most of the guests could not speak. Kings of the Isles #36.